There are many different reasons you may have for taking a screenshot of what’s on your iPhone XS or XS Max. These iPhones use a faster and more secure face recognition feature to unlock their screens compared to the old iPhones, but this comes at the expense of the home button that users of older iPhones are used to. Because of this, taking screenshots on these new iPhones is not the same as it was on older models. 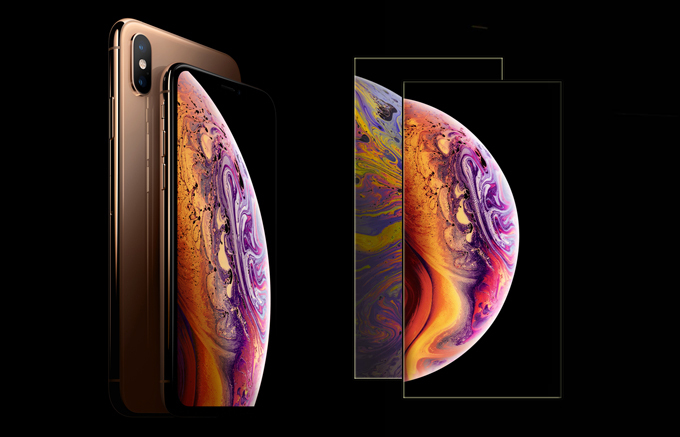 Below are the three different methods you can use to take screenshots on iPhone XS / XS Max. With most older iPhones, taking screenshots can be done simply by pressing the Home button + the Volume Up button. 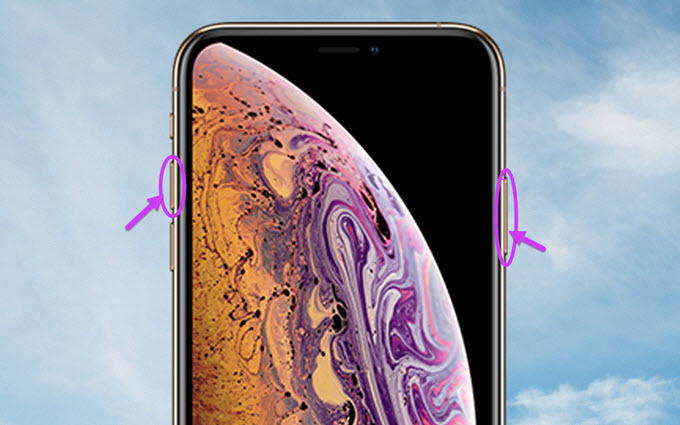 However, iPhone XS and XS Max do not have a Home button, so things are different. To take screenshots on iPhone XS, you can press the Side button (formerly the wake/sleep button) + Volume Up button, and a screenshot is automatically generated. It is very simple and handy. However, with long-term use, you’re introducing more wear and tear on the iPhone’s buttons. Note: Do not hold the buttons for too long or you will end up with the “slide to power off” and “Emergency SOS” options. Uninterruptedly pressing will make it start the countdown to call emergency 911. Please be careful. ApowerManager is an application that can be used to manage your phone data, and it is one of the best screen mirroring apps for iPhone XS. 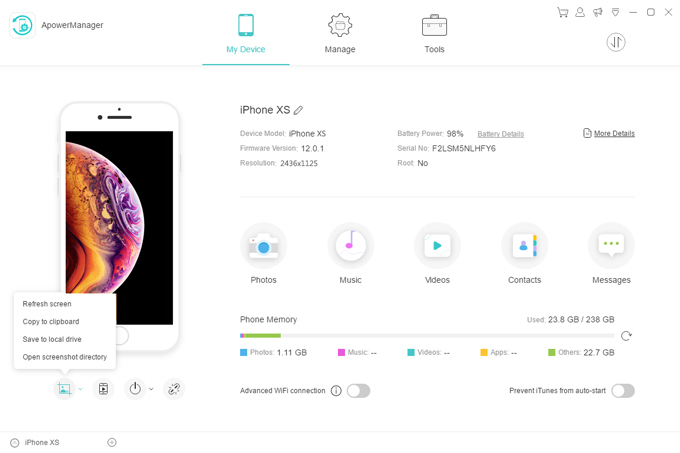 It offers many different functions, such as transferring, backing up, deleting, and restoring data like pictures, music, contacts, documents, and more. Moreover, this tool can help you send a message from your computer. Another great thing about this app is that you’ll be able to set your ringtone easily. Aside from that, you can also take a screenshot on your iPhone XS / XS Max with it. Below is a simple guide on how to take screenshot on iPhone XS / XS Max with ApowerManager. Download ApowerManager on your computer. Launch the app and connect your iPhone XS or XS Max to your PC with a USB cable. The tool will then detect your iPhone. On your phone screen, tap “Trust” to to allow this PC to manage your files. Once connected, simply click the reflector icon found on the left part of the tool. Then your iPhone screen will be mirrored onto your PC. Click the screenshot icon to take a screenshot. Choose where you want to save your file. The Assistive Touch, or virtual home button, is a very handy tool for those who do not want to navigate buttons combinations to take screenshots. It gives you much greater control over your phone, allowing you to make gestures like multi-finger swiping, pinching or 3D touch, and to use Siri. Here are the steps for using it. Enable Assistive Touch. 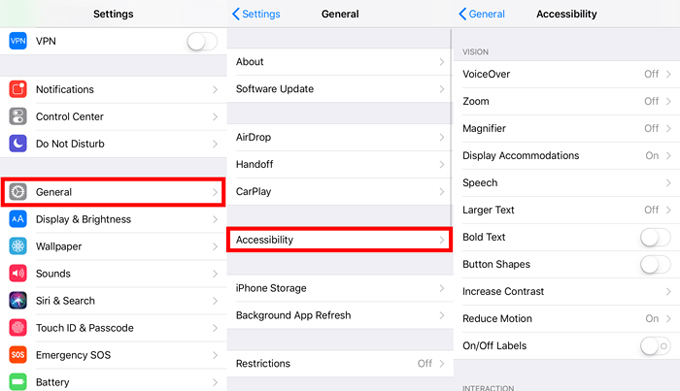 On your iPhone XS / XS Max, go to “Settings” > “General” > “Accessibility” > “Assistive Touch”, then turn on the Assistive Touch. Tap the screenshot icon on the Assistive Touch to capture your iPhone XS / XS Max screen. Dismiss the preview or tap it to further annotate. Sharing moments via screenshots from your phone can be really handy but is sometimes a somewhat awkward process with all the button combinations. However, when using Apowermanager, taking screenshots on your iPhone XS and XS Max will give you greater flexibility and control. It is definitely a more convenient way compared to the other methods of taking screenshots on iPhone XS / XS Max. What’s New in Xiaomi Max 3?